Seinfeld episodes notwithstanding, buying a domain name may be easy, but managing the domain and making smart technology decisions is another story. 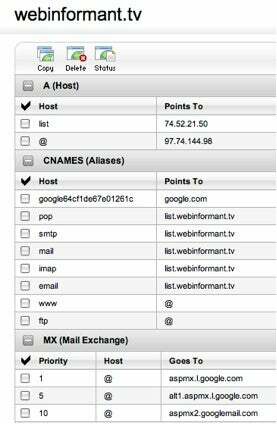 Let's take a look at the steps and decisions involved in setting up Web and e-mail hosting accounts for your domain. An online registrar maintains various DNS records about your domain. First some basics. Getting a new domain is the purview of a domain registrar, someone like GoDaddy.com, Register.com, or even Network Solutions. The registrar handles the paperwork details and bills you once a year for taking care of them. Each registrar handles the various Domain Name System records that tell everyone on the Internet where to find your Web, e-mail, and other servers. The screen shot at right shows a listing of the records for my domain WebInformant.tv. As the entries on the list indicate, I have set up a separate mailing list server called 'list', Google hosts my e-mail (that's what the MX records are for), and my Web site is located at the IP address of 97.74.144.98. You can use your registrar's hosting services for both Web and e-mail services if you wish. This approach is quite convenient, but what happens if you become dissatisfied with your registrar's service and want to switch to a new provider? Relocating your site is easier if your registrar isn't also your host. The Web hosting part of the equation presents you with three basic options: using a Web-based public site provider (free or nearly so); using a virtual private server as your host, running some Windows or Linux Web server software ($50 to $500 a year); or using a managed services provider ($200 a month or more). Cost isn't the only factor: The free public providers, such as Typepad.com, Wordpress.com, Blogger.com, and Livejournal.com, are easy to set up and maintain but don't offer much flexibility with page templates and designs. On the positive side, these providers simplify the tasks of updating your site and drawing traffic to it. With one of them, you won't require the services of a graphic Web designer to build a fairly attractive site. If you're interested in extremely low-cost hosting, check out my blog post "Cheap choices for Web hosting," which compares the services offered by Microsoft's Office Live Small Business and by Weebly. Obviously, you forfeit some control over your site's final appearance; but if you want to launch a Web presence quickly, these are both good places to start. Another option is to use WordPress.com as your main Web site. If you go this route, you must perform an additional step: Have your registrar forward your domain to your Wordpress.com site, or have WordPress perform "domain mapping" for you (under this arrangement, WordPress takes control over the domain and redirects traffic accordingly). I have used both methods. Forwarding your domain from your registrar doesn't cost anything, but the domain mapping method is perhaps more professional; WordPress charges $10 (technically, $9.97) a year for the latter service. On its site, WordPress provides lots of additional detailed information on domain mapping. WordPress has an active community of developers and thousands of plug-ins designed to extend the service's functionality. To deploy them, however, you need to run WordPress's software on your own virtual server at a separate hosting provider. The downside to self-hosted WordPress sites is that their support for streaming video is less capable than is the support at WordPress.com-hosted sites. That difference becomes especially significant if you intend for your site to house lots of video content. Your next decision involves selecting a virtual private or managed server for your site. Many companies offer server space; for help in sorting them out, visit Hosting Review, a site that lets you easily compare plans and prices. Factors to consider (besides how much the service costs) include how much storage you can buy for your plan, whether you have to pay extra for e-mail and applications such as databases, and whether telephone support is included and available during off-hours or limited to workdays from 9 a.m. to 5 p.m.
Should you run your Web site on Windows or on Linux? The differences aren't huge; and if you're running self-hosted WordPress, I recommend using Linux because you'll never have to deal with the raw Linux command line. But if you want to work with Microsoft tools in building and managing your site, use Windows. You'll manage your site's server and related programs through your provider's Web-based control panel; this one for GoDaddy is typical. Whichever provider you choose, you'll end up using its Web-based control panel to manage the server and any related programs running on it. The screenshot at left shows what GoDaddy's control panel looks like. 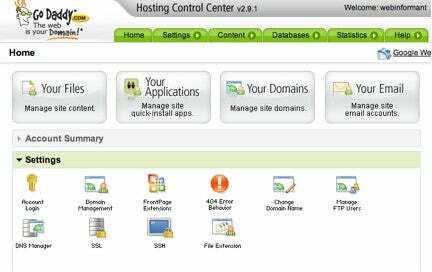 The GoDaddy control panel includes some simple buttons for transferring files to your server, managing common tasks and applications, logging in via a secure terminal session (SSH), and setting up e-mail accounts. Each hosting provider uses a slightly different layout for these icons and tasks, and unfortunately you can't evaluate them in any depth before purchasing your hosting contract. Next, you must decide where to host your e-mail program for your domain. You can use your registrar to host your e-mail--but if you do and you want to switch registrars down the road, you'll run into the same same complications that arise with regard to Web hosting. Another option is to use the same provider that runs your Web site; providers usually offer special deals to make this affordable. Or you can use Google for your e-mail domain, as I do. Google's e-mail hosting uses the same Webmail interface as Gmail, or you can set it up to work with your Outlook or other desktop e-mail client. Google has two different plans: a free one (called Google Apps Standard Edition) that's good for up to 50 users and provides up to 7GB of storage each, and a high-end version (called Google Apps Premier Edition) that costs $50 per user per year and sets aside up to 25GB of storage per user. Nonprofit and educational institutions can get Google Apps Premier Edition for free. The page where you sign up for the standard edition is easy to overlook. The process for subscribing to the premier edition starts on a different page. As part of this process, you'll need to set up the Cname (aliases) DNS record at your registrar, instructing the registrar to start sending e-mail to Google to handle. The Google Apps Help page has more information about this process. If you decide to use Wordpress.com domain mapping and Google Apps e-mail hosting, consult WordPress Support's discussion of "Custom Email with Google Apps." Finally, what should you do about e-mail lists? I talk about this issue in my article "Do E-mail Marketing Right." Overall, I prefer to have a specialized provider--one that runs the Linux software Mailman--host my list, rather than relying on the general e-mail hosting provider; Mailman has better tools for managing list traffic than the general e-mail providers can offer. If you're interested in finding a Mailman provider, check the Mailman Hosting Services directory. That's it. If you followed all of the steps discussed above, you are in a position to be the master of your Internet domain, with a Web site and an e-mail server set up and running.